Chef Paul Bartolotta is passionate about a lot of things. He adores food, for instance, and he loves to travel. An accomplished chef, he's spent his life doing both - usually at the same time. He's cooked all over Italy, for instance, as well as in Paris and in the south of France. He's been a chef in New York, at San Domenico, and in Chicago, where he was a partner at Spiaggia. 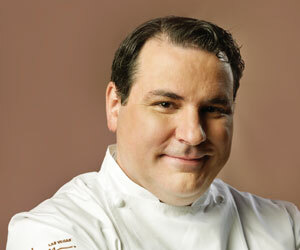 Today, he's in Las Vegas, where he's chef of Bartolotta Ristorante di Mare at Wynn Las Vegas. TravelsinTaste.com spoke with Chef Bartolotta recently about the various cities and countries he's worked in, including their unique and shared culinary cultures, and found out that his greatest challenge wasn't cooking in the Mediterranean or the Alps. It was cooking in Wisconsin. "I have to tell you that the greatest challenge for me was cooking in Milwaukee," he says. Milwaukee is his hometown, and he owns four award-winning restaurants there with his brother, Joe. "Milwaukee provides you with a very solid common denominator because in Milwaukee you have very affluent people that frequent our restaurants, who are very world traveled and very sophisticated diners. You also have Midwesterners who come from good family values who maybe haven't been to New York, Chicago or Los Angeles; maybe they haven't been to Europe, but on occasion they come into our restaurant and are looking for something new and something at the next level. But they are also very much looking for value." "Value is a difficult thing to decide, as everyone has a different perception of value. Value to me involves our ability to communicate what products we use, where we get it and why we get it so they understand the preparation of what it took to put that in front of them so that there is a value perception, not only about price or about portion, but about the overall experience they are having in the restaurant. It's very humbling in a lot of ways, but I think it's taught me to be a very good business person." Milwaukee is a world apart from Las Vegas, though, and both offer unique challenges and opportunities. "What is so unique about the city of Las Vegas is the people are here to have a great time," Chef Bartolotta says. "They are here with the right attitude. There are 40 million-plus tourists or visitors to the city every year. When you're here you are in an extremely competitive environment, but at the end of the day there are enough consumers around to do your job." In fact, there are so many consumers around, he acknowledges, that Vegas restaurants tend to always be on the lookout for the next new customer. "Coming from Milwaukee," he says, "that's exactly how I don't think. Because there's not a lot of tourism in Milwaukee, there's not a lot of corporate business coming into the business. We need to survive by creating repeat guests. They come here with disposable income to try new and different things and there's a little less price resistance for the unique product that I serve. But I will tell you that the moment you think there doesn't need to be a value perception is the moment you're going to be in trouble."